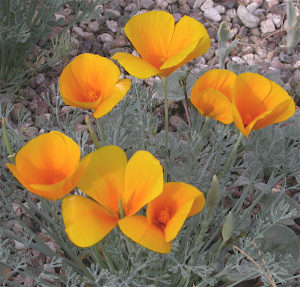 AMWUA has been the go-to source for desert landscaping guides since desert landscaping was a novelty. Plant selection information remains the runaway favorite destination on our website. The site is as easy to use on a tablet or phone as it is on a desktop computer. There is more - and more easily accessible - information in one place. The detail page for each plant gives you the practical information you need at a glance, such as if the plant stays green all year, attracts wildlife, or creates litter. If it tolerates full sun or prefers shade and when it flowers and the color of its blooms. You will know how fast or slow a plant grows and if it grows tall and thin to six feet or remains short and spreads to three-feet wide. Dig a little deeper, and the site will help you understand botanical names, the meaning of growth form, size, color, texture, and offer pruning guidance. It will list all plants that attract wildlife or are pool friendly. The “plant combinations” link offers inspirational photos designed to help a gardener put plants together that will complement each other in size, shape, color and texture. A “wish list” feature allows you to choose and save the trees and plants you are considering. Finding plants you’re interested in at a nursery or demonstration garden is as easy as tapping your phone to see the wish list you’ve created. In a hurry? The “advanced search” allows you to filter through the site quickly, pulling up just the information you need and want to see. At the bottom of each page there are links to AMWUA’s other landscape guides, conservation pros, and information on rebates and classes. This site is the latest generation in a long line of AMWUA plant guides. The Arizona Groundwater Management Act of 1980 established conservation requirements for municipal water providers in the most populous areas of the state. Conservation staff from AMWUA member cities pooled their expertise and resources to launch a coordinated regional effort to save water. A Phoenix-area household may use as much as 70 percent of its water outside. So, it made sense to start looking for ways to help people save water in their yards. This was the early 1980s, an era when homeowners assumed a desert yard consisted of gravel with a couple of cactus. Naturally, many preferred more familiar lawns, citrus trees and colorful annuals. AMWUA conservation experts decided their priority was to demonstrate that desert landscapes could be attractive, shady, flowering—even lush—and use far less water. AMWUA's first pamphlet was called More Green for the Gallon and had a few photos of landscapes and a list of desert-adapted, low-water-use plants. It was something so new that it garnered press coverage. In 1991, working with landscape and nursery professionals, AMWUA recreated that simple pamphlet as a 30-page booklet, filled with photos and useful details. Plants for the Desert Southwest soon became known as Arizona’s “bible” of desert adapted plants. It was redesigned and expanded again in 2003 to include more than 200 plants and was renamed Landscape Plants for the Arizona Desert. To date, more than 1.5 million copies of these plant guides have been published and handed out at nurseries, mailed from city conservation offices and picked up at landscape fairs and conferences. In 2007, the book was developed into the familiar and popular searchable database on the AMWUA website. The improvements introduced this month will give homeowners even more help and information. Landscape Plants for the Arizona Desert is the first of a trio of guides that include Landscaping with Style and Landscape Watering by the Numbers. For more than thirty years, the AMWUA member cities have championed the beauty and utility of desert-adapted trees and plants. Look around. The payoff is impressive.